As you work your way up the stairs to the main deck, you pass a sauna, dive room, indoor/outdoor shower options, and gym, next to which is a floor to ceiling hatch that slides up to let the fresh air and view in, while you work out! 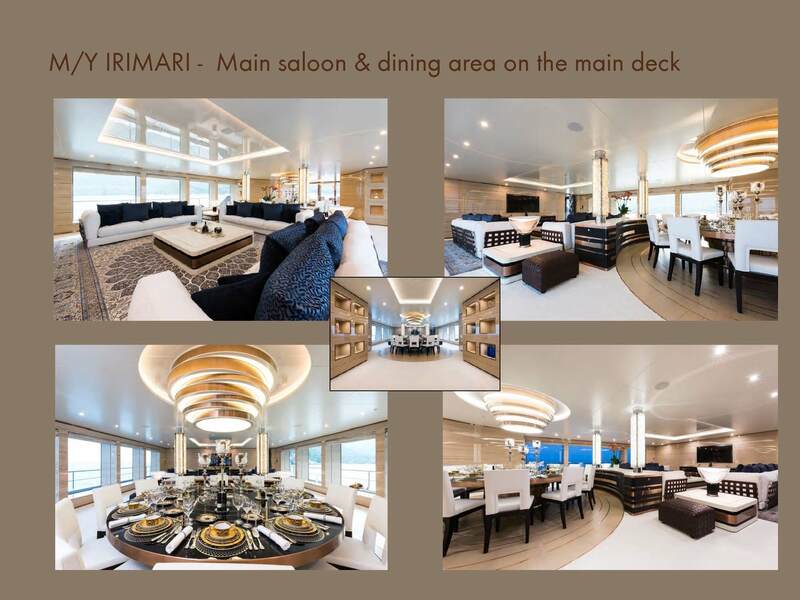 You walk across the main deck aft, passing a centrally located cocktail seating area and bar and enter the main saloon through a grand entrance and see an enormous round dining table with fourteen dining chairs, set with crystal wine glasses and silver plate holders, above which is a big, bold, stainless steel, modern chandelier – absolutely stunning! Beyond that is an enormous centrally located formal main saloon that is both comfortable and elegant all at once. This saloon is meant to be used, because all the comfortable couches face the TV…. You find the spiral staircase that has walls, finished in navy blue glossy paint with filigree cut-outs and feel the indirectly lit, soft, white carpet under your feet. You walk downstairs to the accommodation deck, off of which are four similar-sized guest cabins, comprising twin and double cabins forward and two doubles aft. The two doubles aft convert to a full-width master suite, complete with sitting room and his and her bathrooms in black and white marble with glassed-in stall showers. You enter the full beam master cabin located on the main deck through an office with black desk, three stunning floor to ceiling oval windows and a red couch. 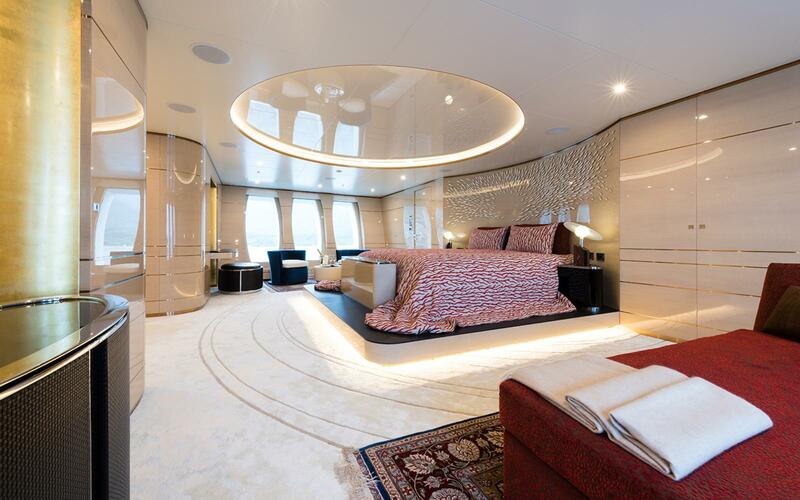 The bed inside the stateroom is a King, whose niche headboard is an artists impression of a large school of minnows…. You expect them to turn at any moment…. This art is fabulous! The richly luxurious, red and white branch bedspread hangs down, spilling out beyond the bed onto a slightly raised black ebony platform, while the bed itself faces forward toward a white marble designer tub, the focal point. Behind the tub is a large glassed-in shower stall…..There’s some etched glass, dual Japanese water closets, and his and her dressing rooms…. 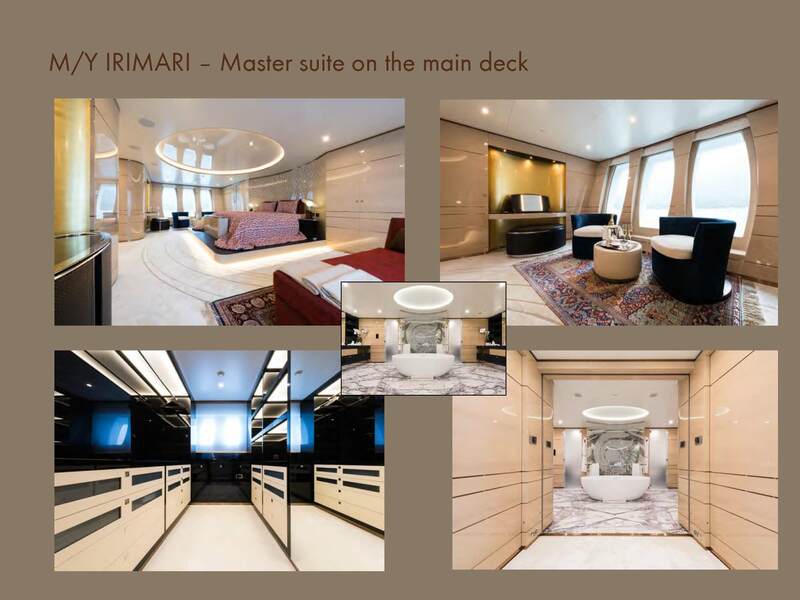 IRIMARI’s master bathroom was the largest bathroom of all the yachts in the 2016 Genoa charter yacht show. IRIMARI derives her name from a combination of the owner’s wife and daughter’s names, so it’s only fitting that the master suite forms a suite with a second bedroom for the owner’s daughter, which can be a part of the master suite or not, through use of a pocket door…. And what a bedroom it is! It has the most exquisite emerald green art piece over the bed that matches the sea foam green bedspread…. The color is refreshing and beachy all at once…. 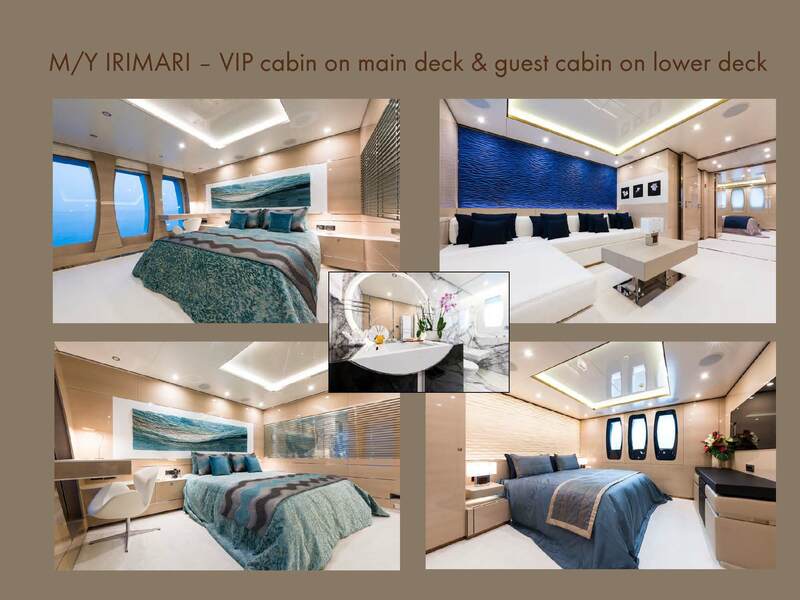 IRIMARI sleeps 12 guests in 6 cabins spread out over two decks with a dedicated massage room on the main deck. 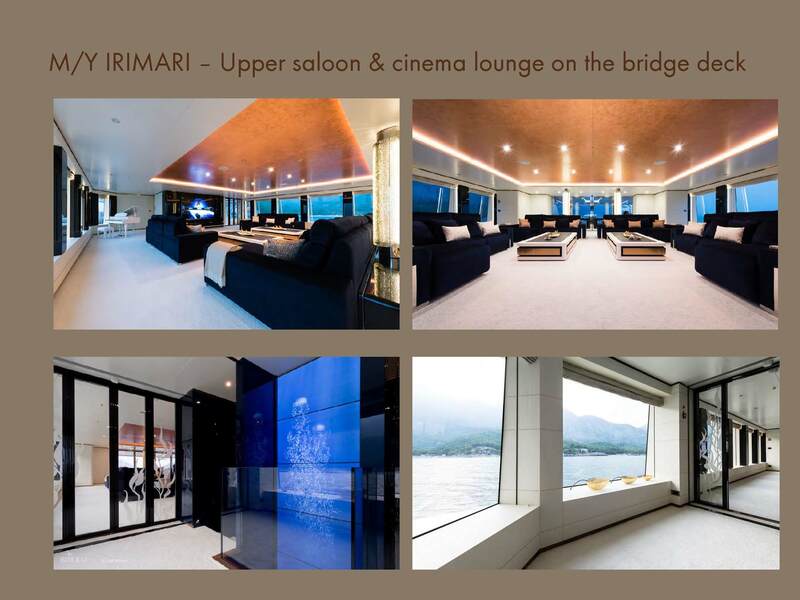 Upstairs on the bridge deck is a centrally located lounge utilizing the entire room in what is called the “Cinema,” another enormous room with four identical couches upholstered in powder blue velour, each with footstool attachment, and all face an 80″ TV. This room leads out of doors to a private dining area with table that seats 14, complete with Versacci dishes and table settings. 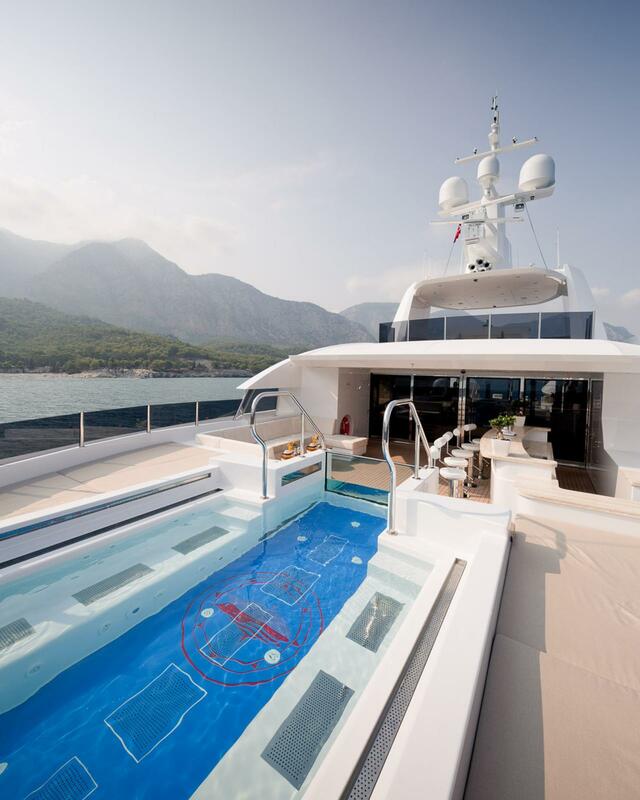 The yacht is run by a crew of 18 including scuba instructor, massage therapist, and restaurant-level, trained chef plus sous chef…. 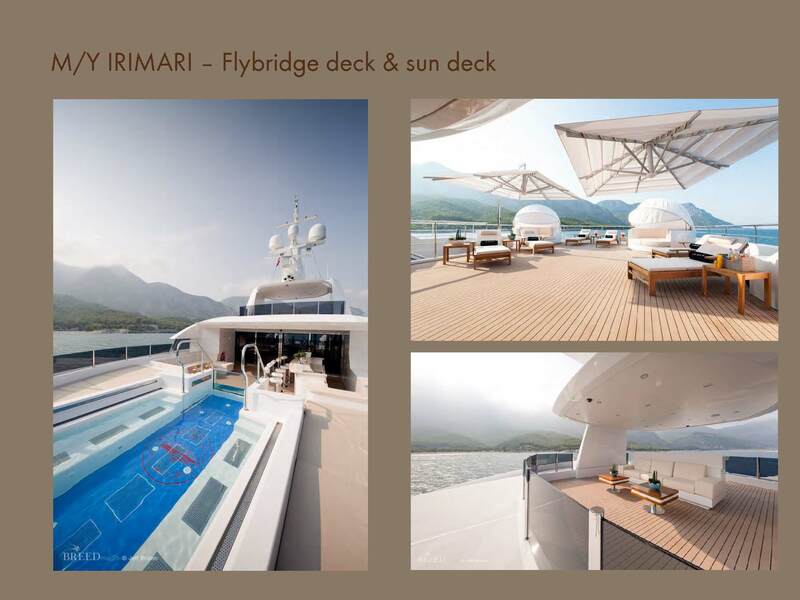 Above the Cinema are two additional decks, including the sun deck and raised deck…. 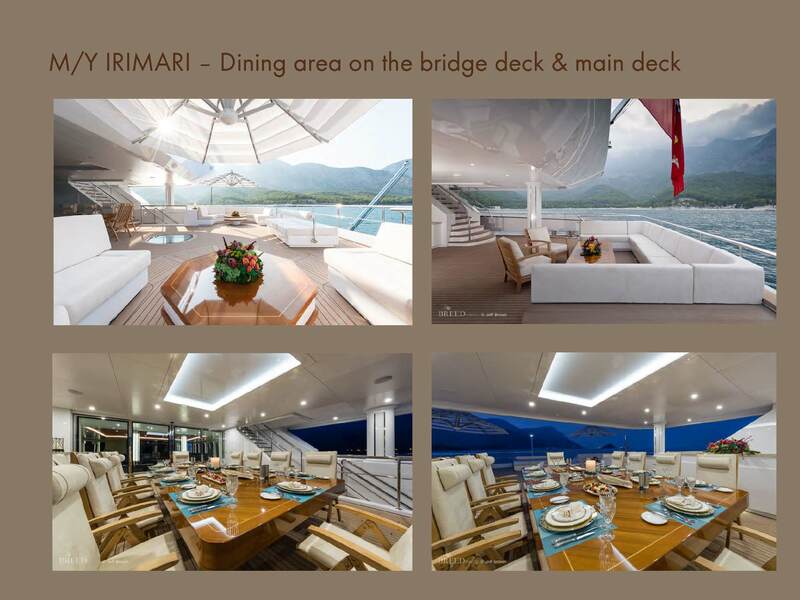 What is unique about IRIMARI’s sun deck, unlike any other yacht in the Mediterranean, is the fact that it’s almost entirely covered by a hard top. So there is plenty of shade. It’s cool up there. Sunbathers will find wall to wall sunbathing bed around the smoke stack on the top deck, which is more private…. 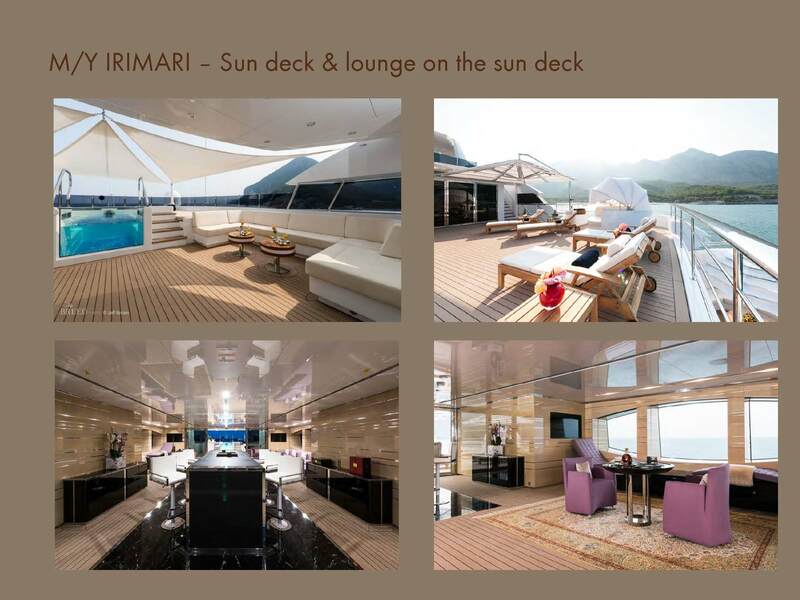 Meanwhile, the sun deck is cool and shaded and features groupings of furniture to fit a variety of needs, such as dining table for 12, buffet cabinet, which lends some separation…. a long U-shaped bar with no less than ten swivel stools…opposite which is an intimate cocktail lounge. The bar doubles as a Teppanyaki grill; there are groupings of furniture around the stern – and the piece de la resistance…. a jet stream pool forward..with current for exercise, around which are sunbeds on three sides. The sides of the pool are Plexiglas; the color is a deep turquoise. So the pool acts as a focal point for guests as they arrive at the top of the stairs. 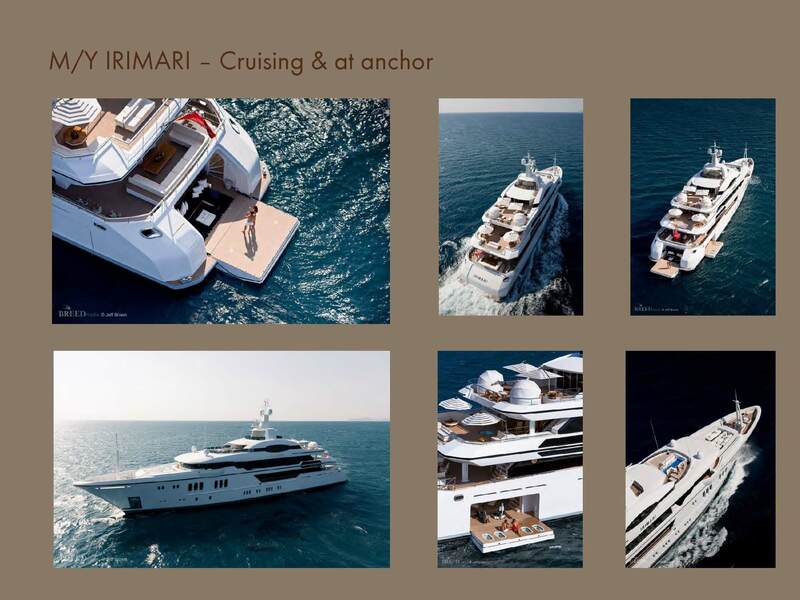 Finally, yes….the 490,000 Euro weekly price is low compared to other yachts IRIMARI’s size, which have half the amenities, yet charge more. IRIMARI is a bargain! Please click to download a photo shoot of IRIMARI.